I used to teach kindergarten and we always did a unit on insects. Ever seeking to increase their vocabularies, I delighted to teach these babies a giant, “delicious” word. How adorable it was to hear such a word repeated with lisps and missing Rs. Keep reading dear skeptical friend. Perhaps this one has a twist. They gazed in anticipation. But in childish clumsiness, one chrysalis was knocked to the bottom of the cage. Finally, after what seemed like forever, there was one butterfly. The next day there were two. On the third day an excited, little voice squealed, “Mrs. Atkins! One is coming out now!” We crowded around to see, and to my surprise, it was the one I thought had died. He wasn’t dead, just knocked down. The struggle was intense. Lying on the bottom of the habitat, his fight was radically more difficult than that of his brothers. He had to battle for his very existence. We watched mesmerized, and I couldn’t voice the heavy thoughts forming behind teary eyes. He finally emerged, wings crumpled as if broken. 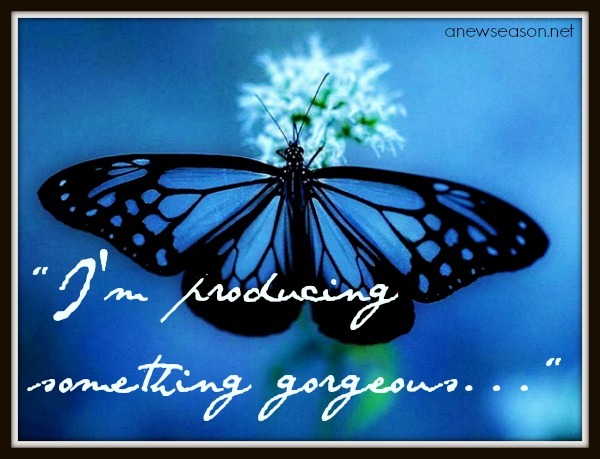 How utterly shocked was I when the butterfly finally unfolded his gorgeous, perfect wings in praise to his Creator! The significance was not lost. That’s me. I was knocked to the bottom of the cage, but God transformed my broken, twisted frame into something marvelous. I left my assistant in charge, and had to take a moment to collect myself. Do you ever feel like you’ve been knocked down too far? Do you think you are damaged beyond repair? Then hear these words of truth. Let them resonate deep within. If you are redeemed by the finished work of Jesus, you are NEW. You are being transformed to be like Him, but you are also ALREADY transformed. You may have been through fire and water. Perhaps like me, you long for the place of abundance. Well, it’s already here. Jesus is the abundant place. Because you are transformed, abundance is not circumstantial. You are in Christ. Sometimes I find myself lying on the bottom of the cage, but still I have gorgeous, perfect wings to open in praise to my Creator. My dear Father, I praise you that true transformation is not cliche, but rather reality. By your Son, I am new. By the Spirit I have life and power. Teach me to view myself as you view me. Precious. Beautiful. Covered by Christ. Remind me of my identity. I was broken, but now I am whole. I get knocked down, but you will not let me be destroyed. I praise you. < Previous When lies are like lions.